The Iowa Department of Natural Resources is reviewing water testing done for nitrates in 43 public water supplies after discovering some results which didn’t look right. DNR environmental specialist Kathy Lee says the problem happened with samples tested by Mangold Environmental Testing in Storm Lake. “We noticed some irregular sample results and we investigated with Mangold and we determined that after they put a new piece of equipment in place, some incorrect sample results were calculated,” Lee says. Lee says they asked Mangold to stop doing samples and have been working with them to try and determine what went wrong. 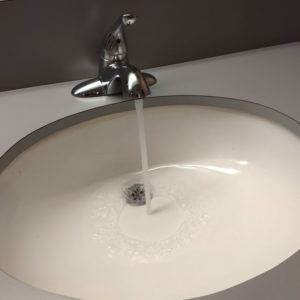 “At this time we don’t have any information to suggest that there is any problem with any of the drinking water supplies that utilized Mangold environmental testing,” according to Lee.”However, we are reviewing all of the data — particularly to see if any of the results can be recalculated — so we can replace those values in our database.” She reiterates that they haven’t determined that any of the samples tested had high levels of nitrates. Lee says Mangold has been cooperating with them as they try to figure out the issue. She says the DNR does requires notification within 15 days when new equipment is placed into service at testing facilities and Mangold didn’t let them know for a couple of months. Lee doesn’t know yet if the company will face a penalty for the late reporting. “Our investigation is ongoing and…any decision regarding enforcement action has not been made at this time,” Lee says. The DNR and Mangold each sent letters to the operators of the water supplies to notify them of the issue. Akron Water Supply; Battle Creek Water Supply; Breda Water Supply; Danbury Water Supply; Dow City Water Works; Early Municipal Water Supply; E-Stop (Coucil Bluffs); Evangelical Covenant Church; George Water Supply ; Gilmore City Waterworks; Grand Jct Municipal Water Dept; Hamburg Water Supply ; Holstein; Humboldt Country Club; Ida Grove Water Utility; Iowa Cage Free; Kingsley Water Supply; Lake View Water Supply; Lewis And Clark Monument; Linn Grove Water Works; Livermore Water Supply; Mallard Water Supply; Mapleton Municipal Water Plant; Marathon Light & Water Department; Oakland Munic Water Utility; Pierson Water Supply; Quimby Water Supply; Rembrandt Enterprises Inc (Rembrandt); Rock Valley Rural Water District; Schaller Water Supply; Schuler Manufacturing; Shenandoah Water Dept ; Sidney Water Supply; Sioux Rapids Water Department; Southern Iowa Rural Water Association – Corning/Brooks ; Southern Iowa Rural Water Association #2 (Creston); Smithland Water Supply; The Learning Journey ( Council Bluffs); Tobey Jacks Mineola Steak House; Twin Lakes Utilities; Ute Water Supply; West Central RWA; Woodbine Water Department.